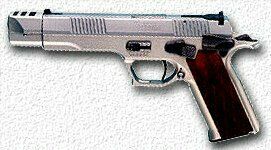 Semiautomatic pistol, geometric short barrel recoil locking system. Cal 9x21/ 40S&W/ 45HP-ACP.The magazine is prismatic and with ambidextrous unhooked botton. Magazine capacity: PC9S 17 shots, PC40S 13 shots, PC45S 13 shots. The	single action and the totaly adjustable trigger mechanism, together with the compensator suitable with any commercial ammunitions, guarantees a flawless operation. The line of aim is totaly adjustable, and the frame is manufactured with a particulary light alloy	and a special steel. Barrel lenght 134 mm/rifling 8DX450 mm. Weight PC9S 1250 g., PC40S 1230 g, PC45S 1200 g. Total length 265 mm. Total width 45 mm. Total height 135 mm. Finishing: all the steel parts have	been chromium plated and glazed, all the parts in alloy have had a particulary oxidation treatment. Scope mount available. Walnut grips. The "evolution" series of pistols, thanks to its pedigree of build quality conforms to highest competition firearm standards of materials and workmanship. The particular slant (angle) of the grip, standard mounted compensator for a clean and easy shot with perfect recoil control, coupled with the adjustable trigger mechanism and sighting system inherent in all PC series, ensures absolute precision. TECHNICAL DATA Model PC 9S, GT 40S-PC 40S, GT 45S, Calibre - 9x21 IMI, .40 S&W, .45 ACP, Magazine - 17 shots,13 shots, 13 shots, Length:265 mm. Width - 44 mm. Height - 135 mm. Weight - 1250 gr, 1230 gr, 1200 gr, Barrel length - 134 mm. Sight radius - 176 mm.